Here’s something that should put the fear of god and of the two-seam fastball into the Cubs: Corey Kluber still had plenty in the tank when he was pulled after six-plus innings. As dominant as Kluber’s nine-strikeout performance was, Terry Francona is holding him back. He’s saving him. The World Series is a short series to begin with, and now it’s even shorter for Chicago after Kluber and the Indians took Game 1, 6-0. And not even just because the Cubs now have to win four before losing three, but because two more of those game are going to come against Kluber, if need be. Francona has been coy about his rotation plans, saying he’ll figure it out based upon what Trevor Bauer and Josh Tomlin do in Games 2 and 3. But that quote, along with common sense, make this a promise and a threat: Kluber will be back on Saturday, on short rest, for Game 4 in Chicago. And for Game 7, if necessary. (Let’s take an aside for a brief bullpen panegyric: This is what top-notch relievers can do for a team. They shorten games. They, as a unit, pitch every day, making them as a collective potentially more valuable than even a lights-out starter who can only be great every fourth or fifth day. And as the Indians illustrated last night, they allow you to think big and plan ahead. Does Francona remove a rolling Kluber after just 88 pitches and with a three-run lead if he doesn’t thoroughly trust the back end of his bullpen? Might Kluber not be able to return on short rest if he had been needed to get the game to the eighth or ninth? The losses of Danny Salazar and Carlos Carrasco might have been fatal for any other team. The knock-on effects of having trustworthy relievers can be felt long before and long after they actually get in the game. Back to Kluber: He was close to unhittable. Beside the nine strikeouts (five looking), even the balls Cubs hitters were able to put wood on generally weren’t convincing swings. Plenty of credit to his breaking ball—a truly unique thing that has more velocity than most curveballs and more movement than most sliders, leading to genuine confusion about whether to call it a curve or a slider—but his sinker carried the day. With a velocity in the mid-90s and an outlandish drop, Kluber’s two-seam fastball made Anthony Rizzo and the Cubs look silly. Kluber only started throwing a two-seamer late in 2012, right around when he started emerging as one of MLB’s best starters. That’s probably no coincidence, and has his rotation-mates trying to learn their own. 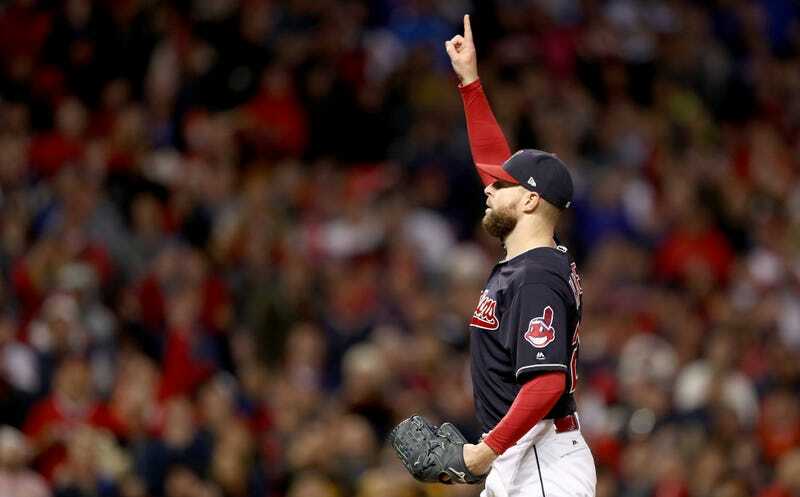 With Kluber lined up to start Game 4 (and 7), the big rotation question is whether Bauer and Tomlin will also be asked to go on short rest, or if Francona will turn to Ryan Merritt in Game 5 as he did in the ALCS. That feels like an important issue now, because if the Cubs are going to win this World Series, they’ll either need to beat Kluber, or win every single game he doesn’t start. Both feel imposing.